Kill Team Received an Errata and a Designers Commentary on September 28. Please read!!! Come join us every Saturday night (except September 29!) for a 12-week long Kill Team campaign, starting September 22. We will be using the campaign system from the Kill Team Core Manual to run a campaign where players will battle each other to capture or steal resources from each other. Per the Core Manual, players must build a Command Roster at the start of the campaign with 12 models. There are four different resources to fight for and each scenario will tell the players what happens to their resources if they win or lose. For a summary of how a Kill Team campaign works, here is an overview provided by Warhammer Community. Each week will have a special Tactics Card distributed for players to use in their battles. Campaign Cards will be distributed in Victory Comics that will be stamped to record battles fought and updating the resources won or lost. Rewards have been provided by GW for Participation and Performance each month. At the end of the campaign there will be a Facebook-based painting competition, with the award of a GW-provided signed Art Print. 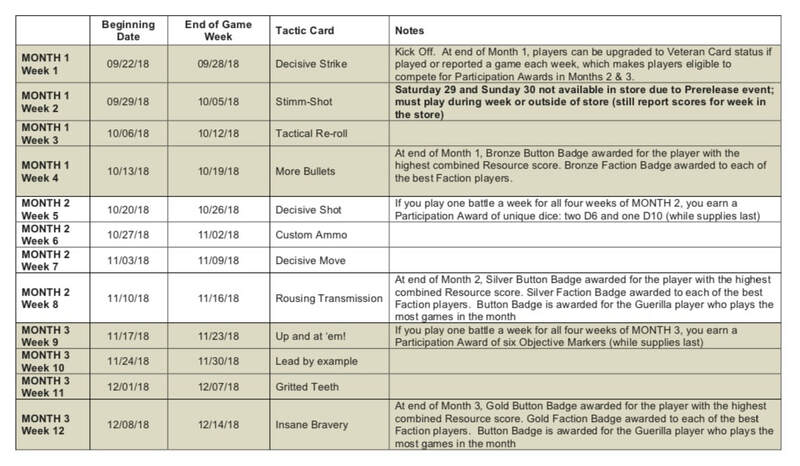 Below is a chart showing what is happening each month and week in the campaign, and what awards can be earned and how.